I am only beginning week three of my journey to being comfortable enough to wear a bikini once again and already I have learned a lot. This is just a little bit of what I have learned so far. Offering cool prizes is not enough to encourage other bloggers to join in on this journey. I have decided to eliminate the giveaway portion of bikini ready by spring. This is now my journey and my journey alone. Getting motivated to work out five times a week is harder than you think. When I am tired or stressed or have a day full of appointments for my kids I find it more difficult to fit in my cardio, weight training and ab work outs. When you work out regularly pay more attention to your calorie intake. I realized that I am eating more and filling up on carbs after I have a good work out. My body is hungry after burning extra calories. I need to find a low calorie energy food to substitute for the high calorie carbs that I am consuming. In order to see a difference in your waistline you need to do a combination of cardio, abs and weight training. Doing Just Dance 2 on the wii is not only a great cardio work out it is fun and a wonderful stress reliever! You should try it sometime. When trying to lose weight or just get fit, your calender is the best tool you will have. My calender has become my bible. Celebrating a birthday is a major distraction from sticking with a healthy diet. Fresh produce will spoil if you leave it in the refrigerator in the garage and forget about it. Your kids will have fun working out with you if you let them. Waiting for the weather to warm up enough to start walking and running outside is frustrating but well worth it. Related Kids Of Smokers More Likely To Be Obese? I want to thank my two sponsors for Bikini Ready by Spring, Extreme Workout Plans and Sydney Elder Independent It Works! Distributor. They are no longer offering prizes for this. 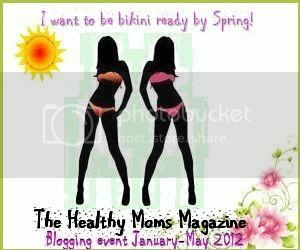 Instead I encourage The Healthy Moms Magazine readers to visit their websites. On January 20, 2012 my weight was 105lbs and my belly around the navel measured 31″. On February 3, 2012 my weight was 104lbs and my belly around the navel measured 27″.